Help, I've searched and searched but I can't find out the cost of DS Advanced. It's pretty daft to make it so hard to find. I want the version that will allow me to make shaders and do rigging. So is that DS4.5 Pro Advanced? I have never had 'Advanced' before - but may suddenly be able to buy it - depending on how much that is. Why is it so well hidden? No...DS 4.5 Pro...the free version includes all of that, now. Advanced was a 'lower' version of DS4. You cannot get just the Advanced version as far as I know, and the version you have depends on what serial number you enter, at least it always did in the past. As mjc1016 says, the Pro version contains everything that was in the Standard Version, Advanced Version, and a few more things besides. In order to get the pro version of DAZ Studio 4.5, you will need to have a DAZ Account, purchase the free product, download it, get the serial number from you account and place it in the registration page of DAZ Studio. There will also be other plugins that will need to be installed to run all the capabilities. I already downloaded DAZ Studio 4.5 Pro when we got the alert that it had come out - but I didn't bother installing it after looking at Version 4 - because version 4 was so much less easy to use than 3 was - all those big blocky controls in the parameters with limited functionality, everything in the wrong place, and no space for the actual scene. A nightmare! So I thought 4.5 was just another version like that. So are you saying that the new 4.5 version has all the functionality that all the previous versions could only give you if you paid for the biggy version? So can you do everything with it? No extra plugins to buy or anything? Ah, DAZ_bfurner, you said other plug-ins. Is that the part you have to pay extra for? I was going to say 'sorry' if I was wrong and you can now get everything - the full program - for free, but if that's really true, then I'm not sorry at all - I'd be amazed, but sorry does NOT describe it - ecstatic is more like it - amazed, euphoric - yeah, all of those. I'd better go and install the darned thing quickly then. Decimate and Animate2 are the ones that aren't included...Animate2 drops to a 'lite' mode after 30 days. Everything else is included. Nowhere, Jimmy, I've been hanging around all the time. I've had Bryce7Pro since I bought it when it first came out - and I don't regret that - it's a brilliant program. (I've had Hexagon for as long too, but I don't rate that so much. I said I downloaded 4.5, I just didn't realise that all the hype wasn't just the usual 'whizz bang, get it now it's superduper' that most Americans and some UK salespeople always say no matter how great - or not so great something is - but really was true. Are you really sure about this? It won't time out or something after a month or so? Oh, and now that I've looked at the immense amount of bits that 4.5 downloaded as - can someone point me to the installation instructions? What to click on first and 2nd and so on and so forth??? Forget that bit - I found the installation guide. Nope, on a second look at the instructions - I'm still asking what order to install in - the guide says nothing to the point. And can I still keep DS3, like I could with DS4? I don't mind so much if DS4 is replaced by 4.5. Or even better, is it possible to get 4.5 to have the same layout as 3? The same look? I do have a 64bit PC - so I could install as 64bit - only will I still be able to use the Bryce to DAZ bridge? I ask because I know that Bryce is NOT 64 bit. What does 'Decimate' do - will it time out like 'Animate2'? What does Animate2 do? How much does that cost? You can still use the Bryce bridge using the 64 bit version, yes. It will not time out or anything else, it is in your Order History, and you have a serial number, exactly the same as the paid for version except for Decimator. The Darkside style is included in the main installer now, and it is about as close as you will get to DS3 layout. You can put the names of the tabs along the top in Preferences, instead of down the side if you want. What, like proper dropdown menus? really out of the way? How much are they and what do they do? and, what order do I install this lot in? There is a newer version of DS 4.5 out today, I downloaded and installed it, it solves some problems with UberArea lights and also the render Settings among other things. I don't know how you got 4.5.0.114, but the latest one is a Beta right enough. 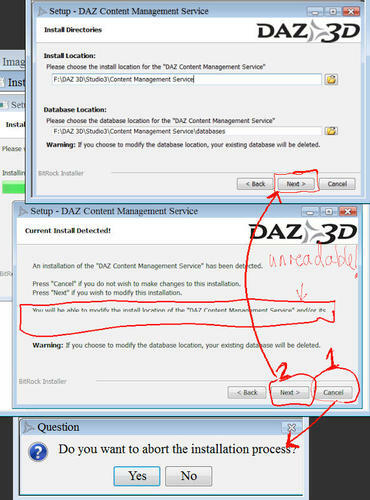 What you need to install is the DAZStudio_4.5.0.114_Win64.exe, that is the main installer. Then install the Genesis Starter Essentials. Unless you have ZBrush, you don;t need the GoZ plugin, the DS 3DBridge one is for Photoshop, and if you haven't bought decimator, don't install it either. Animate 2 is for animation as you would guess, and uses aniblocks. Decimator is really for gamers to reduce the poly count of DAZ models. Both can be bought in the store here. But you will need to install the separate content file. An even newer version - shouldn't I just download that instead then? 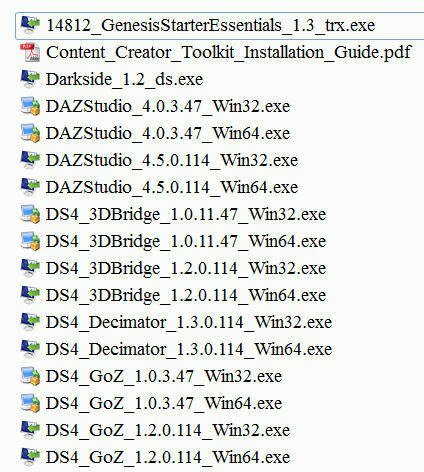 So is the part of DAZ Studio that allows you to do rigging in the already downloaded DAZStudio_4.5.0.114_Win64.exe then? Oh? Where do I get that from then? The seperate content is Genesis Starter Essentials. The 3DBridge is for Photoshop, and has nothing to do with Decimator which is a totally different plugin. All of the CCT (Content Creation Tools), and any other Pro plugins are in the main installer, including Autofit. Ah, I've already downloaded that Genesis stuff. Why do you say 'including AutoFit' - is there something different about that? Should I install the version of DS 4.5 that I have already downloaded, or should I go and look for this newer version instead? Note that the new version is still a beta — meaning it isn't yet the final release version, the programmers are still playing whack-a-mole with the bugs, and some extra features might still be added. Don't get this yet unless you really know what you're doing. Or if you like living on the bleeding edge...or are just a masochist. I think JimmyC meant that if you did not buy Decimator, you should not install the Decimator file. Bridge for Photoshop does not need Decimator. You would need Decimator if you want to produce a game, it is used to reduce DAZ models to lower poly count. And rigging should be included in DAZStudio_4.5.0.114_Win64.exe. So why is DAZ Studio 4.0.3.47 in the downloads? Do I just ignore that? In case for some reason you have to back step. For example I needed to go back and redo some product files and since they were originally done in 4.0 I back stepped (for cohesion) to do the clean up. Once I finish I'll move back to 4.5 again. Oh right, so as the version of Daz4 I have installed right now is 4.0.0.343 - I can safely ignore 4.0.3.47 - good. If I click on 'cancel' because I don't want to change anything - then it says - "do you want to abort installation?" - well, no, of course I don't want to abort - I'm just halfway through, so I click 'No' but then I'm back where I started. But if I click on 'Next' (2) I'm offered this other screen, with a warning about database deletion - so I don't change anything but click on 'next' and --- well basically it's just sending me round in circles - HELP!??? I don't want to change anything, I don't want to abort the installation, I don't want to delete anything - what the heck do I do????? I think it just cancels the CMS install...not the whole thing. So I say 'yes' to 'abort installation process'? Feels like a bit of a runaround... sigh. Okay, well I've installed everything, and it's failed somehow - all I have is Daz Studio 4 Standard when I click on the desktop icon. Not 4.5 and not Pro. Where did you install 4.5 to? Where was the previous DS4 installed to? If you right click on the short cut and choose properties, where is it looking for the DS4 exe file? It's alright, I was just giving up and going to bed - it being after half past 3 in the morning, and as soon as I closed FireFox, POP! the DAZ Studio4.5 icon appeared, ( it wasn't there when I just minimised FireFox, only on actually closing it) plus an icon I know nothing about and didn't ask for - which is suspicious. What is all that about? I don't like it when programs install extra unasked for icons on my desktop, there are too many there already. Iv'e got TORE too on my desktop before....because i installed daz 4.5 on another old version....it doesn't say pro version in the menu,well it's hard to say this but........i solved that problem only with formating my windows....there is a lot of icons on your desktop right?i tried to remove them from their source,don't look for them in program files because you won't find them there,try to see in windows folder but search as deep as you can...i didn't finf them anyway,and i got my windows formated not just because of them,i changed it from xp pro to 7 pro,i hope you get things right mate. That should say "Store" and it's a new 'feature'...a desktop link directly to the DAZ store...and unfortunately, if you delete it, it comes back with every install you do. The only way NOT to get it is run the installer manually in console mode...and even then I'm not sure if all the installers obey the commands.